Create the excitement and fast paced action of your favourite winter sport in your own home. 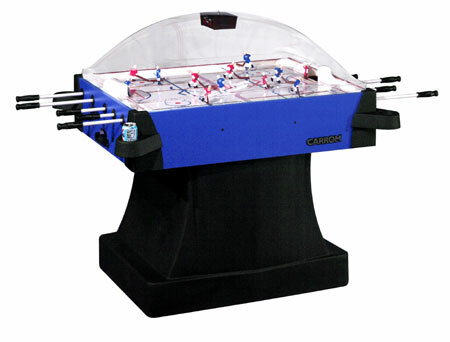 Our high quality Dome Hockey game tables will look great in your game room. On game night with your friends, you won’t even miss the pros! -One piece arcade polypropylene sturdy pedestal base for accurate leveling and stability. -One piece sleek design snow banks for faster play. -Cabinet is heavy board with high pressure Prism Blue or Red Melamine. -All corners covered with protective caps and slide-on cup holders. -Full perimeter extra thick edge banding on cabinet. -Playfield is 1/4" thick tempered Masonite with custom coated graphics. -Subsurface covers entire inside area of cabinet and os pinned in 12 places for added strength. gears provide extended life and durability. -Solid fiberglass rods with cushioned grips. -Battery operated scoring unit tracks periods and acknowledges each goal with light and sound. 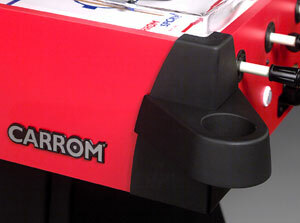 -Scoring unit can be reset at any time and shuts down after two to three minutes of non use. -Game is fully assembled except for scoring unit and four bolts to pedestal base. Length with rods protruding from cabinet 58"
Cabinet ....................... 58 1/4" x 36 1/2" x 25 1/2"
FREE shipping for residential delivery within the continental United States. Canadian shipments are $200 and include customs clearance. or call us at (514) 684-6484.